The NAI Brush Cutter attachment is a heavy duty land clearing marvel. Choose either the Mid-Flow Brush Cutter or the Low-Flow Brush Cutter according to your machine needs. 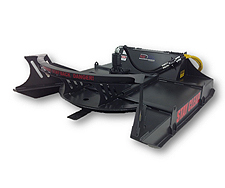 Both attachments have a direct drive with an extra heavy duty bearing assembly with an 8 bolt flange, resulting in a durable machine that is not constrained by tough terrain. Each unit has a built-in relief valve to protect the hydraulic motor.